Thank you for tagging us. I just about did an excitement pee when my mom told me about it. So sorry it took us a couple of days to come up with our answers. Here we go! My mom snoring. Not a darn thing. I make myself comfortable in the bed and don't really care too much if I happen to fall asleep in your spot. Not moving. Period. 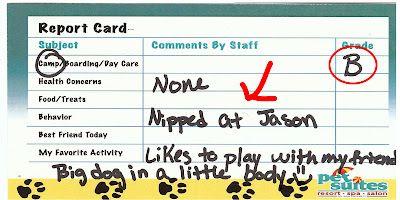 If you have read my blog for long, you may recall that I once had aspirations to be an Olympic Diver. This phase has passed, and now I think I am pretty much all the world can handle just the way I am. Nothing. Big dogs, the spraying part of the stuff for my itchy paws, and my dad's shop vac. WHAT IS THE BEST AND WORST PART OF BLOGGING? The best part is knowing that every now and then we put a smile on somebody's face. The worst part is knowing that sometimes we just don't. WHAT'S THE LAST BLOG YOU VISITED? WHAT IS ONE THING YOU WISH YOU COULD CHANGE ABOUT YOURSELF? See earlier answer about how I am not sure the universe could take much more of me. Sorry. Somebody is gonna have to tell us what this means ???? How much time do you have? Jazzi is a 5 year old Scottie from Illinois. 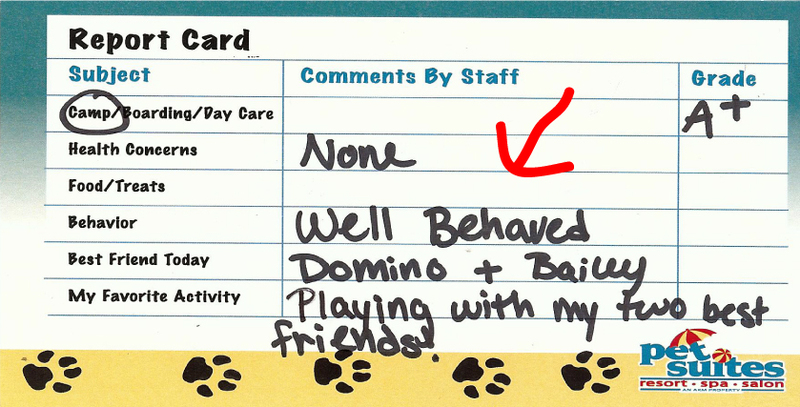 She has a mom and dad and there are munkins (grandkids) in her house that she gets to play with. Note to self: get some grandkids. I would like Jazzi to be my girlfriend, but she has Sweet William the Scot. From what I can tell, there is no way I can compete. For the last year, she has had a sister named Addy living in the house with her, but Addy is moving away soon. We know that makes her sad and that makes us sad. Jazzi drives a fire red convertable, likes to steal tacos off the table from time to time, and is one good looking set of paws. She's all that, and more, I tell you! Now that I am growing up a bit, I am willing to acknowledge a few things about myself. I am confident enough now to go ahead and share with you all this fact: I am easily excitable. But you already knew that, didn't you?? I tend to get a case of the wiggly butts from time to time. 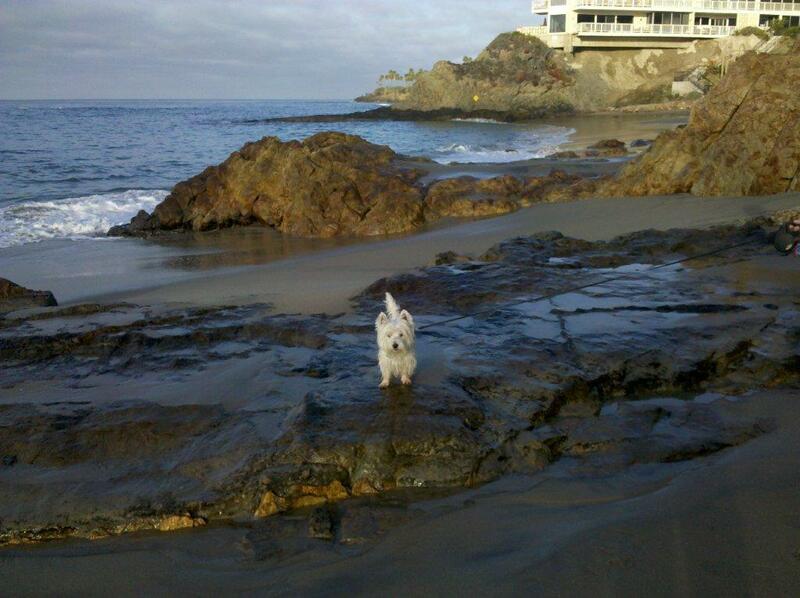 And occasionally I jump up and down a whole lot just a few times in a row. For instance, sometimes when I know I am getting ready to go out for a walk, I start racing around the house and no matter how many times my mom reminds me that I am not going anywhere until I am all leashed up, I just can't stay still. Just can't help myself I tell you! So, mom and I were wondering if any of you have tried this product? 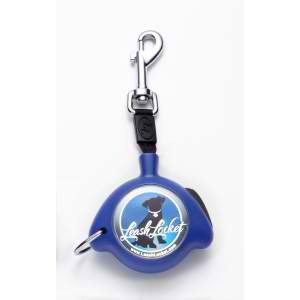 It is called a Leash Locket, and what you do is hook the leash to your collar like a locket on one of your mom's necklaces. That way, the leash is always there and you don't have to slow down to get one put on before you head out for you walk. We're thinking it might be worth trying. Your thoughts??? Well, you know me. I am nothing if not styling!!! 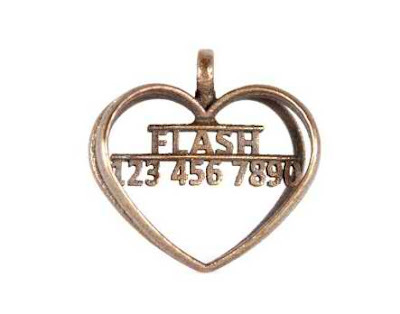 If I were a girl instead of a boy, I might just want this fancy ID tag from Flash Gordon. It's very special and a bit unusual, like moi!!!! They have some pretty terrific other designs too. I got to go TWO DAYS IN A ROW!!!!!!!!!!!!!!!! Well, I know you might have been worrying a bit. 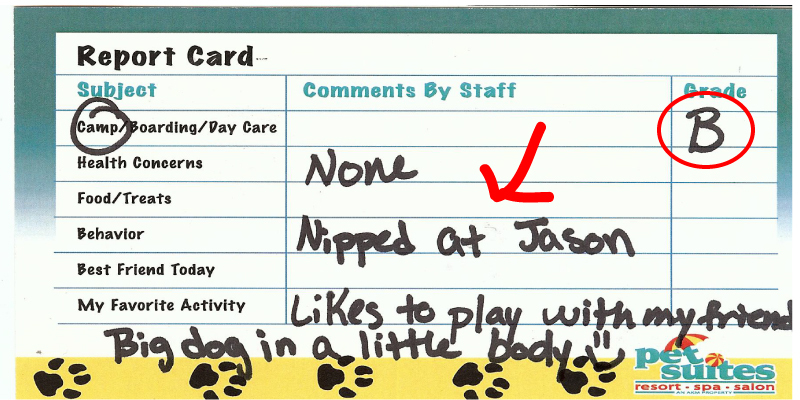 You know, that I was still in the dog house and all after nipping at Jason. 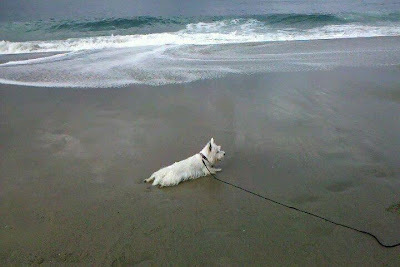 But let me tell you, my mom must have taken all your comments about that is "just how we Westies roll" to heart because I GOT TO GO TO THE BEACH!!!!!!!!!! Man, I love the sand. Oh, boy do I love those waves. OK, well not really because they attack me and steal my ball, but I love the IDEA of the waves. Wowza I love to get all stinky. Life is good here, puppers. 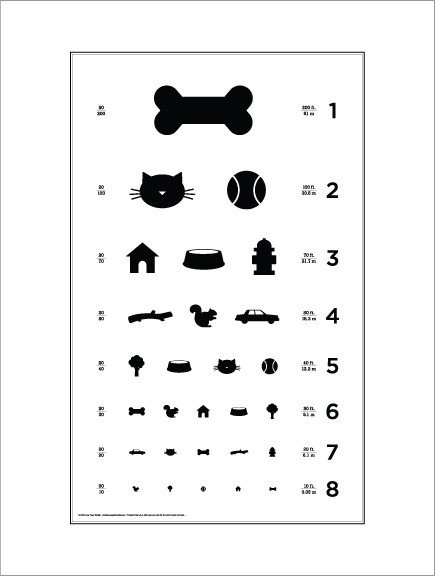 Ohhhhh, we love this eye chart for puppers. 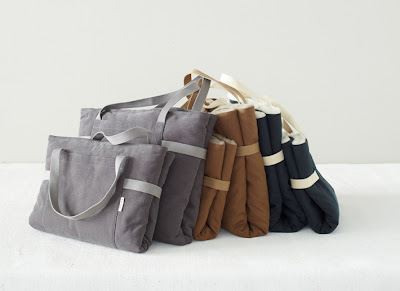 We originally spotted it on Pinterest via our friend Cate at Under the Blanket. This poster is 18" x 24" and they say they designed it for Vet offices primarily, but also for pet lovers. I can sooooooooo see this in our office. And, yay yay yay, $1 from every sale goes to Best Friends Animal Society. It's $16 and you can get it from Local Paper Studio here. Go get it puppers, go get it!!!! Hard to think of a way to say it any better. WOW ... the perfect combination of me and my mama! 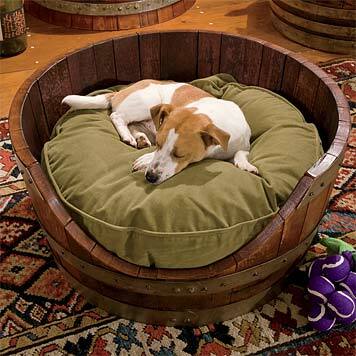 Check out this dog bed from Orviss that is made out of an oak white wine barrel. Ohhhh, maybe some of my mom's favorite wine was made in this one!!!! And it fits a very comfy cushy dog bed for moi. This is what it looks like when family interests COLLIDE!!! Well, you know. I really can't help it. I got alot of girlfriends. I should have started my Valentine's shopping ages ago. What was I thinking ????? 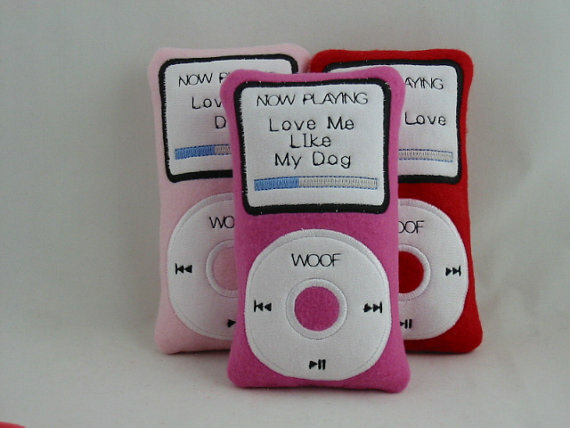 If you like what you see up there, you can get them from Hot Dog Couture's Etsy store here. My mom said we have to give these four paws up for Good Dog Design because they remind her of a handbag. And Mom loves handbags. These are actually travel beds for dogs from Cloud 7. Kind of makes you want to start packing for a sleepover, doesn't it??? Well, at least it happened to one of us. Meet Uggie, the dog from" The Artist." Do you think it is because he lives in Hollywood proper and not in a far southern suburb that he became famous instead of me? My mom says that it is because he has worked very hard and is actually trained, something which I have always shown great resistance to. Yep, not so into that part of it, truth be told. Mom said some talent is needed not just my devilishly handsome good looks. Really???? 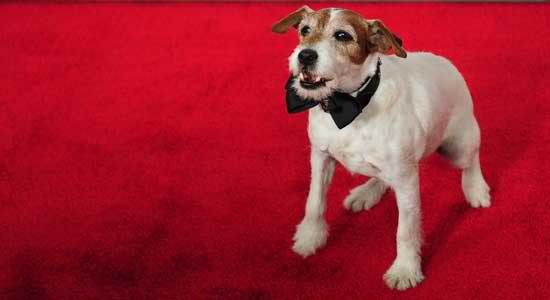 Uggie is apparently rehearsing for an appearance with Billy Crystal at the Academy Awards. Woof, woof and four paws up for puppers getting to go to these award shows. Perhaps that should be my angle here. You know, if you can't beat them, join them and all that stuff. At the end of the game, we vote for Mr. Quigley. What clinched the deal for us was the dancing over the finish line in the end. Do you think they really make Skeechers for puppers? I got a little itch thing going on with my paws and I fear the next step for me is shoes when I am out walking. It hasn't happened in a loooooong time, but I got an A+ in camp on Friday. It doesn't happen often .... can't usually control myself. 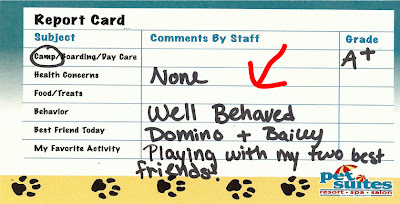 They called me WELL BEHAVED!!! Didn't spend any time in the dog house all weekend. Woot, woot ... what a ride!!!!!! Check otr this commercial that is going to run during the Super Bowl. 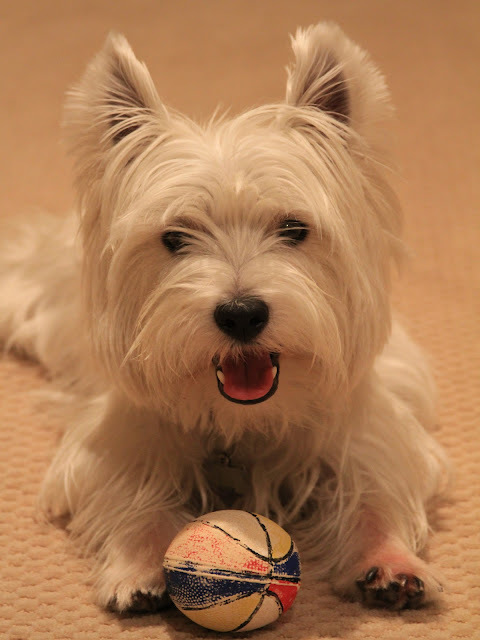 Love that the commercials are going to the dogs as that is the only part I am much interested in anyhow!!!! 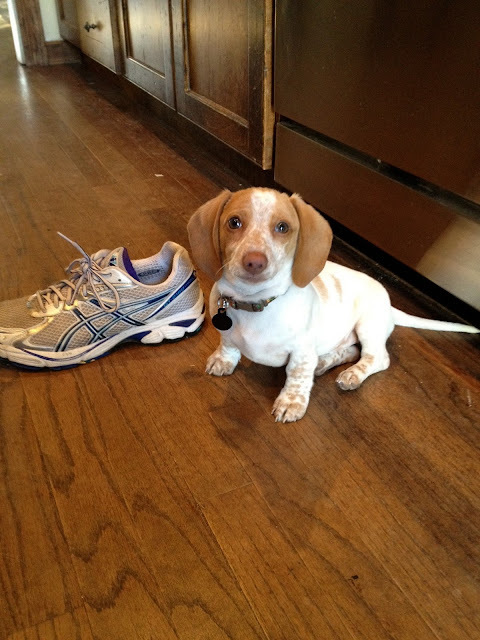 Meet Maggie Ann, the miniature dachsund puppy my mom cheated on me with this weekend. My mom went out of town without me again. And she cheated on me again while she was at it. I know, I know. Live and let live. But, seriously, look at that cute face up there. I could be in real danger of being replaced with that one. And those ears. Seriously floppy goodness. Thank heavens she is geographically undesireable because that is about the only unwonderful thing I can come up with! 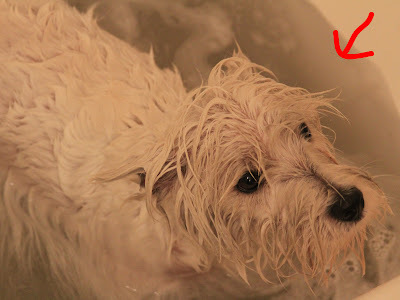 Can you see how dirty that water is???? I was a complete mud ball!!!! You know, this time it really was NOT my fault. Nope, not my fault at all that I came home from camp so dirty I had to hit the tub immediately. You know, I was just playin' with my buds and all of a sudden, just like that, I was black. My mom said it reminded her of one time when the fires got real close to our house and we had "fire dust" everywhere. She said my paws looked like my brother's did after a walk in the "dust." 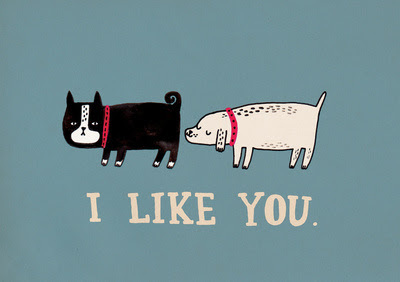 What can I say puppers. Serious fun can be seriously dirty!